Hundreds of years ago, the ancient people from the Altiplano, that lived at the shore of the mystical Lake Titicaca, built a series of funeral towers to bury their kings and other important people of their regions. 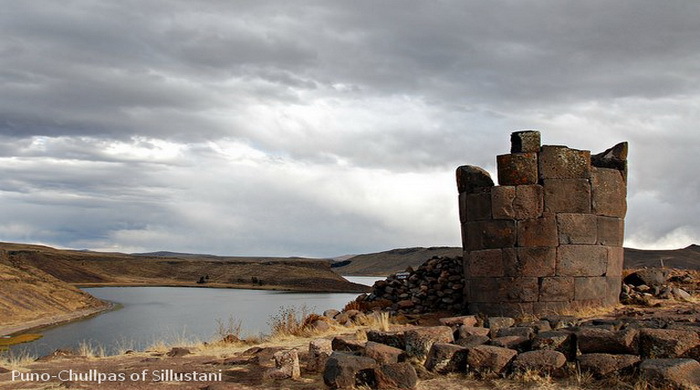 This tour begins with the gathering of tourists from their hotels to go in transport for about 45 minutes to reach the necropolis of Sillustani. Arrival and ascend to the top of the peninsula where they are located chullpas through a gentle way and visit. We will return the original access to the site, consisting of 78 stone steps, which we are too weary to make them rise. We try at all times not to strain too much of our visitors, however you should be prepared for a walk at least 30 minutes. Besides the visit to this enigmatic place, we will take the visitor some native housing modules, thereby establishing a direct contact between tourists and residents as well as camels or Waru warus, Andean agricultural technology (pre-Inca). Also seen in the way grazing llamas and alpacas.